A swarm of robots will soon be overtaking John Deere’s Wisconsin plant, reports New Equipment Digest (March, 2016). 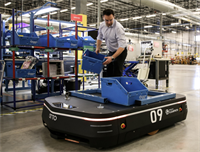 A fleet of new-generation AGVs will begin zipping through the lanes of the company’s assembly line, hauling parts and materials across the plant in an efficient, automated buzz. On the face of it, there is nothing too exciting about this news. Automated Guided Vehicles have been scurrying around plants in one form or another for decades already. But John Deere’s fleet will mark the latest deployment of Clearpath Robotics’ OTTO 1500—a fully self-driving, autonomous robotic vehicle using Google Technology. The machines are capable of transporting up to 3,000 lb of goods through congested plant and warehouse environments without the need for drivers, supervision, or guidance infrastructure. That last detail is what makes this technology exciting. Traditional AGVs require a lot of work and a lot of free space to run safely and efficiently. In the past, this has meant tying them to magnetic strips or grids of barcodes crisscrossing human-free transport lanes. OTTO taps into the same sensor-driven, high-computing backbone of Google’s self-driving car to safely and efficiently transport supplies along the same plant and warehouse paths populated by workers and equipment. OTTO is basically off the track–similar to the difference between subway systems and taxis in a busy city. There is a time and a place for a subway system. But when speed and efficiency are needed, there is also a time and a place for taxi cabs. To make that jump, Clearpath had to tap into the full arsenal of today’s technological tools. Here’s a short video of the OTTO in action, click here.